1) Preheat oven to 350°. Grease a 6-cup loaf pan with 2 tbsp. of the butter; set aside. Put milk, eggs, and vanilla in a bowl and beat until well combined; set aside. 2) Sift together flour, sugar, and baking powder into the bowl of a standing mixer fitted with a whisk, beating on medium speed, then add remaining 13 tbsp. of butter, 1 tbsp. at a time, waiting until each is completely incorporated before adding more. 3) Slowly add milk-egg mixture, beating constantly, until batter is just mixed together. 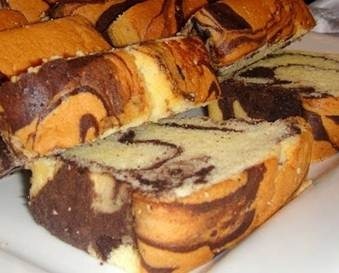 Separate batter in half, mix in melted chocolate in half. Pour batter with no chocolate into buttered loaf pan. Then pour in chocolate batter and taking two butter knives mix batter with chocolate into a swirl pattern. 4) Bake until a toothpick inserted in the center of the cake comes out clean, 55-65 minutes. (Lightly cover cake with a piece of buttered foil during baking if it begins to get too brown.) Allow cake to cool on a rack for 5 minutes, then unmold.